Is Volley Ball will become the best Ambassador for the Rwandan Sport ? If we see results recorded in last 10 years, the Volley Ball made huge progress. Both Clubs and National teams attended to majors competitions in Africa, with often good results. Rwanda was also the first Volley Ball paralympic team from Africa to go to Paralympic Games, it was in London. 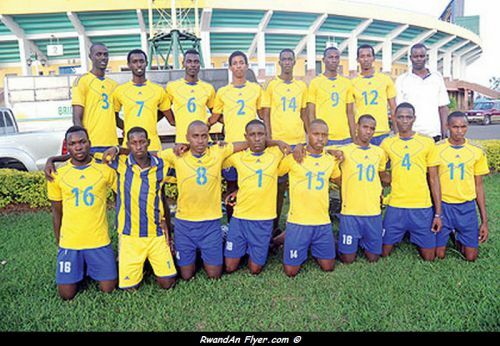 RWANDA Junior National team defied odds to secure a berth at this year’s FIVB Men’s 21 World Championships which will be held in Ankara and Izmir, Turkey from August 22 to September 1, 2013. Rwanda beat Algeria 3-1 [25-19], [25-13], [16-25] and 25-22] to sail through to the semi finals of the Africa championship yesterday in Tunisia. Bonnie Mutabazi, Samuel Niyogisubizo ‘Tyson’, Nelson and skipper Aimable Mutuyimana are some of the players who impressed as Rwanda frustrated Algeria to win the decisive game. The youthful team beat Congo Brazzaville in the opening game last Saturday before losing 0-3 last saturday to Tunisia in the second group game on Sunday. They bounced back strongly to boost their hopes of making the last four with a 3-0 victory over Sierra Leone on Tuesday. Rwanda under Kenyan-born experienced coach Paul Bitok will face Egypt in the last four on Friday as hosts and defending champions Tunisia play Morocco in the other game. THE national youth volleyball team, Under-19 has started intensive preparations ahead of this year’s World Youth Championships which will be held in the Mexican cities of Tijuana and Mexicali from June 27 to July 7. The national team head coach Jean Marie Nsengiyumva engaged the youth team into early preparations over the weekend at Amahoro indoor stadium. Nsengiyumva who is assisted by Kayonga Ntawangandi have boosted the national team with four players who were not part of the squad that snatched the World Cup ticket in Algeria last month. The players include; Jean Paul Ndacyayisenga [younger brother to Rwandan international Pierre Marshal Kwizera], Placide, Habarugira, Samuel ‘Tyson’ Niyogisubizo and Fabrice Rugina. However, Niyogisubizo is not part of the team because he is currently with the U-21 team which is taking part in the African junior tournament in Tunisia. Rwanda qualified for the World championship after winning a bronze medal at last month’s CAVB Youth Championship held in Algeria.